DAY #3: Cool thing about NOT driving on the Interstate. You see a lot more amazing scenery and a whole lot fewer cars. In continuing our summer adventure out West, we opted to travel the back roads from Steamboat Springs, Colorado to the Grand Tetons in Wyoming instead of the Interstate. Took Route 40 west through Colorado and then followed U.S. 191 north all the way to the Tetons. The roads were well paved and well marked but only 2 lanes. Incredibly. during the entire trip to the Tetons, we only saw a handful of other vehicles. We sped along at a breezy clip without a care in the world wondering where all the summertime traffic was. We're guessing they were all on Interstate 80. Although this portion of our trip took longer, it was abundantly worth it. We passed through some of the most jaw-dropping scenery we've ever encountered. The towering mountains of Colorado scale down to lush, green plateaus with sweeping vistas as far as the eye can see. Every hill we crested, we were rewarded with a "wow" moment. 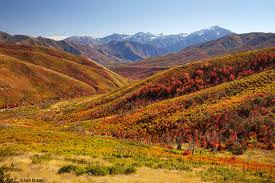 The Northeast corner of Utah and Southwest Wyoming all along 191, put on an astonishing show of panoramic buttes and bluffs, canyons and gorges, lakes, red rock escarpments and spectacular snow-capped mountain peaks that stretch as far as the horizon...for hundreds of miles. Any of which would give the Grand Canyon a run for its money. All for the price of a tank of gasoline. No crowds. A smattering of isolated outposts with more cows than people. Mostly we saw cattle, antelope and wild horses. Nary another vehicle crossed our path. The splendor of this majestic natural beauty is world class. And yet very few people even know it exists. I snapped some photos but pictures can never capture the true essence of this breathtaking scenery. So detour off the Interstate and experience the happy surprises of an off-the-beaten-path road yourself some day...wherever you live. We're the only car on the long and winding road through Utah and Wyoming. 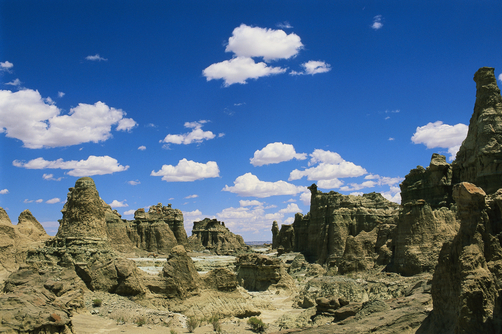 Red rock canyons span the horizon in Utah and Wyoming. 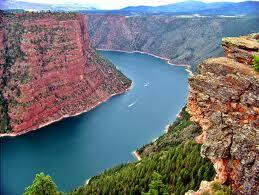 Flaming Gorge Lake is stunning. Scenic Wyoming off the beaten path. Twilight captures the Windy River Mts. in Wyoming in the distance. Beautiful! We are headed to Yellowstone later this summer and hope to utilize several of the more scenic "back" roads. You're so right about taking the side roads. The only thing is that in California where there are so many more cars, it's almost a death trap to drive the two lane highways. There's always some one who has no patience and has to overtake. Then you find yourself hurtling towards someone on your side of the road. But that's probably only in Southern California.